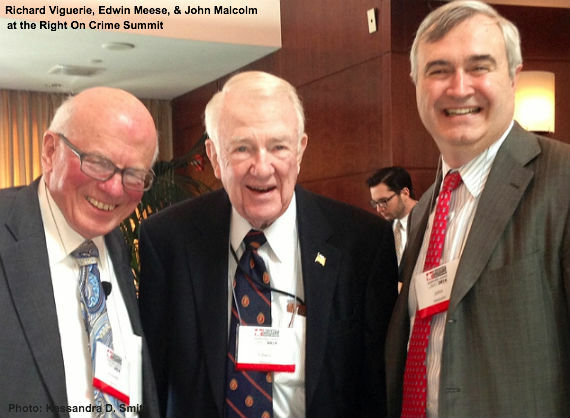 Over 100 conservative leaders and elected officials from around the nation gathered in Washington on May 21 for the first Right on Crime Leadership Summit. Conservatives in Texas, Mississippi, Georgia, South Dakota and other states are showing how to reduce crime while saving taxpayers hundreds of millions of dollars through smarter ways to reduce recidivism of community offenders. Among those touting win-win conservative reforms were former Speaker Newt Gingrich, former NRA president Dave Keene, Americans for Tax Reform’s Grover Norquist, former Congressman J.C. Watts, American Conservative Union Foundation’s Pat Nolan, and ConservativeHQ’s Richard Viguerie. Appearing via video feed were Governors Rick Perry (TX), Nathan Deal (GA), and Dennis Daugaard (SD). Prison and corrections costs have been the second fastest growing budget item for states, and America has the highest per-capita prison population in the world. The system is not working by anyone’s standards. Recognizing the growing costs and lack of return on taxpayer investment in their safety, Texas began the model of reform that has reduced crime in a state already known as tough-on-crime. Reforming long-ignored systemic problems, Texas reduced the number of returning prisoners through education and training for nonviolent offenders, and better treatment of drug addiction, which is a major causative factor in many crimes, especially property crimes. Texas was able to close three state prisons as a result. Speaker Gingrich noted that this movement has really just begun, but is already flourishing because it is proving itself successful. Delegates to this largest-ever gathering of conservatives on this issue included officials from Mississippi, who explained how they went about accomplishing recent reforms despite skepticism from key interest groups. The Mississippi model is worth studying. Lieutenant Governor Tate Reeves explained that Mississippi’s reforms came about because state prison costs had increased $120 million over seven years despite only a four percent increase in the prison population over the same period. The Right on Crime reforms will now save $266 million over ten years. House Speaker Pro Tempore Greg Snowden noted that part of the problem lay with a disconnect between the criminal justice process and the corrections system. Judges were surprised to learn that the corrections treatment failed to match the reasons for sentencing. As a former prosecutor known to be tough on crime, Mississippi House Judiciary Committee Chairman Andy Gipson explained that the prior system was not working for the public safety due in large part to the serious recidivism problem. The corrections system was not altering bad behavior of nonviolent offenders, sometimes making it worse, yet inevitably returning them to the community. The Right on Crime-style reforms focus on rehabilitation efforts using both drug courts and efforts to reduce drug dependency within the corrections system. Gipson also noted that these reforms are consistent with conservative principles of reducing crime, saving taxpayer money, and protecting family values. State Senator Brice Wiggins related that he and his colleagues needed to overcome initial opposition to these reforms from prosecutors. Mississippi created a task force with leaders from various interests with a stake in the solutions. He explained that government task forces sometimes miss the mark, but Mississippi’s “team effort” approach on these reforms worked. More needs to be done, and the summit provided a valuable exchange of data and ideas. Former Virginia Attorney General Ken Cuccinelli said that too many people with mental illnesses are in the prison system and not getting proper treatment. A number of religious leaders also called on their colleagues to recognize that prisoners and their families especially need spiritual support and guidance. Corrections systems too often do a disservice to the ties between prisoners and their loved ones who are key to their return to a crime-free life. Richard Viguerie noted that with conservatives leading on this issue, it is now safe for politicians to go “into the water” of criminal justice reform. Marc A. Levin of the Texas Public Policy Foundation, who has been a tireless leader in this cause, noted that now even federal officials are following the states’ examples. Right on Crime is a project of the Texas Public Policy Foundation, and has received funding and superb support from the PEW Charitable Trusts. UPDATE: This article was updated to correct Pat Nolan's organization affiliation (ACU Foundation) and to include the name of the former Virginia Attorney General, Ken Cuccinelli.